As media were surprisingly more on squatters’ side this time, next day the police came up with very lame story of anarchists trying to burn a police car “as a revenge for Klinika”. In disclosed video, they didn’t even manage to make the “damaged” car dirty from flames and Klinika disavowed from this act immediately, so noone moderately sane could believe their tale. But mainstream media enjoy blood, so they turned their approach to the case back to their beloved witch hunt against squatters and anarchists. Moreover, the promised negotiations with authorities, which could possibly help to find a solution for Klinika, are more about lying and explaining why it’s not possible to do anything at all. To support Klinika – to deliver them some energy for their fight – many support acts are going on these days. There are solidarity events like concerts, happenings, discussions etc. 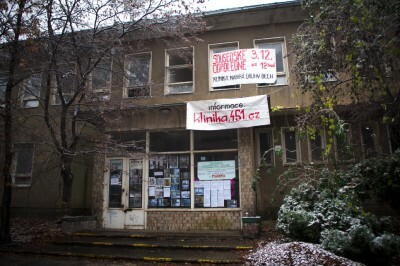 being organized in Prague and various cities around Czech republic. Also in virtual space, different ways of support are shown – e.g. individual people and organizations are posting their photos showing support to Klinika. It’s up to you to do so as well or be creative! Also watch their web and social networks for latest news and check for next events to come. Klinika still lives!